What is a Sport Mouth Guard? A sport guard is a custom-fitted mouthguard designed to protect your mouth from the risk of injury during play. Why Would I Need a Sports Guard? Did you know that you can protect your teeth from sports injury using a mouthguard? Whether you play hockey, football, volleyball, rugby, baseball or martial arts, studies have proven that “when athletes do not wear mouth guards, they are 1.6 to 1.9 times more likely to experience a dental injury (Sports Medicine, 2007)”. The mouthguard will help protect against injuries to your teeth, but could also help protect your jaw, lips and gums. Sports guards are also helpful to lower the risk of concussion. How Do Sport Guards Work? When you visit our dental office, we will take impressions of your teeth to fabricate a customized mouthguard designed to fit perfectly to the shape of your mouth. A personalized sport mouth guard will provide a much higher level of comfort than store bought versions and can be worn over braces. Typically made from a special type of plastic, a sport guard can protect both your upper and lower teeth from injury. 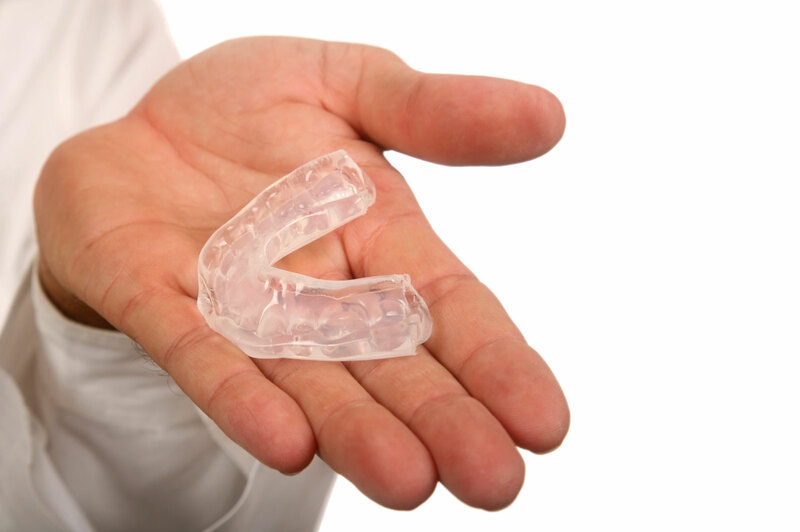 Contact our team today to learn more about custom mouth guards.